(Left to right): Brad Griswold, Ted Halbach, instructor, Jordan Ebert, Megan Lauber, William Walleser, Henry Holdorf, Courtney McCourt, Connor Willems, Lexi Piepenburg, Cody Getschel, Bieke de Bruijn, Jessica Dercks, Alyssa Nuttleman and Micheala Slind at Purina Farms, Gray Summit, Mo. Cows in a transition barn need adequate space to lie around and relax as they prepare to have a calf and start producing milk. When in the milking pens, it’s stall comfort, quality feed and lots of day lighting that make all the difference. For the calves, they require a well-ventilated, warm, dry area to spend their formative weeks. Small changes to these areas on a dairy farm can have huge impacts on milk production and cow health. They are issues 13 students in the Department of Dairy Science’s recent Purina Dairy Nutrition Experience course, held Jan. 4-9, learned to consider when analyzing a dairy farm. They also learned important networking skills and the ins and outs of a dairy nutrition career as the course took them from their farm audit to the Leading Dairy Producer Conference in the Wisconsin Dells and on trip to St. Louis, Mo. to tour the Purina Animal Nutrition Center. Feedback from the students showed that the course was a huge success, inspiring students to consider pursuing careers in dairy nutrition, which they hadn’t thought much about before. Sophomore Micheala Slind says the course awakened a passion for calf and heifer nutrition on a dairy farm. Dairy science chair Kent Weigel says courses like this are essential for students and are part of the department’s goal to prepare students for success in animal nutrition. The six-day course started with a farm audit at United Dreams Dairy near Baraboo, Wis. There, students surveyed different aspects of the farm, such as the transition and lactation barns, the calf feed center, the milk center, and the feed center. During the audit the students were looking for ways the owners could increase their efficiency and production, raising profits. Among other solutions, they found ways to improve pen ventilation, stall comfort, and older cows’ pregnancy rates, allowing for small, quick changes to result in fast payoffs. The group then presented their recommendations to the farm owners, Tim Evert and Rick Lehman. Both say it was helpful for the farm to have a fresh pairs of eyes look at their protocols and also helpful for the students to be guided in the project by staff from Purina, an operating division of Land O’Lakes. After the farm audit, the students traveled to the Leading Dairy Producer Conference. There they went to sessions that delved even deeper into dairy nutrition, covering everything from forage quality to breeding techniques and how they fit into the overall health and management of a dairy farm. The students also learned the importance of networking from the Purina staff, who mentored them at the conference and throughout the course. The students say the staff were a great asset and were always available for questions and career advice, even after the course was over. 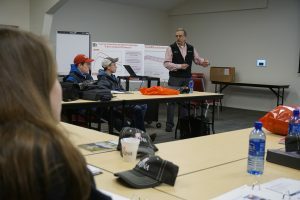 (Left to right): Brad Griswold and Jordan Ebert listen to Gary Geisler, Purina Animal Nutrition regional calf and heifer specialist lecture on calf rumen development. 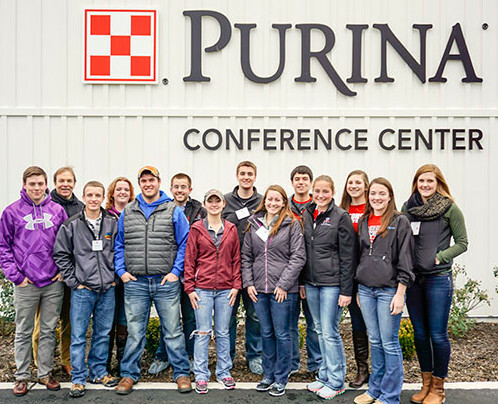 Next, the students were off to St. Louis for a tour of the Purina Animal Nutrition Center and even more mentoring from Purina’s staff. Countless Purina leaders took time to give presentations to the students or show them around the facilities, such as the Large Animal Metabolism Unit, Heifer Innovation Center, and Feed Milling Research Center. They covered topics surrounding all areas of nutrition, investigating the nutrition research process, collecting data on dairy farms, sustainability in agriculture, and how the study of engineering, chemistry, and physics all impact dairy nutrition. Kent Phalen, area sales manager, and Brian Gutenberger, a dairy sales specialist, played a large role in the development and execution of the course. They explain that Purina’s investment in the dairy science students is an investment in the future of the field of dairy nutrition. Planning for next year’s course has already begun. The organizers will incorporate course feedback and their own observations to make it even more beneficial for the students involved. Phalen remembers how the partnership between Purina and the Department of Dairy Science began. He, Brian Gutenberger, & Bob Prange met with department leaders to discuss how Purina can add value to the university and how the university can add value to Purina. The team created innovations such as the experience course and a Purina Ph.D. Fellowship Program. This entry was posted in News by mrstrauss. Bookmark the permalink.